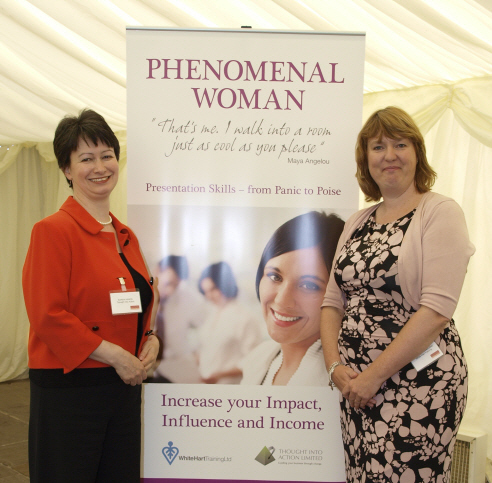 Catherine and I were delighted to be invited to speak at what was surely one of the most glamorous events on the women’s networking calendar this summer, East Lancashire Chamber’s Lunch & Learn at the Inn at Whitewell. Appropriately enough, the theme of the day was ‘speaking skills’ and we were joined at the top table by fellow presenter Kim Chamberlain of Chrysalis for Women. I’d love to think that between the three of us, we gave the Chamber members a taste for public speaking and the business benefits that are within reach of any woman in business: entrepreneur, owner/manager or executive. Several of the members subsequently joined us for our seminar, ‘From Panic to Poise’, in Haslingden a month later and we’ll be adding photos to the blog soon. Proof if it were needed that speaking skills are great for winning business. Just think for a moment how much simpler it is to stand up and talk for half an hour to an audience of 30 or 40 people, some of whom will undoubtedly be interested in your products or services, than it is to work the room every time you attend a networking meeting, hoping to reach those same people by good luck alone. All of us are far too busy these days and here is one way to maximise your time and energy to great effect. Don’t let a lack of confidence hold you back any longer! If you’re a member of a women’s networking group and you’d like us to come and speak to you and your fellow members, please contact us directly or post a comment on this blog. Our focus is North West England but we’re branching out, so please get in touch wherever you’re based and we’ll do our best to meet your needs. Thanks are also due to Kim Chamberlain who paid us the greatest compliment of assuming Catherine and I had been working together for a long time, based on our polished performance together. You’ll have to come to one of our talks to Cherchez Networking or Forward Ladies groups this autumn or join us at our ‘From Panic to Poise’ seminars in November to find out the real answer!